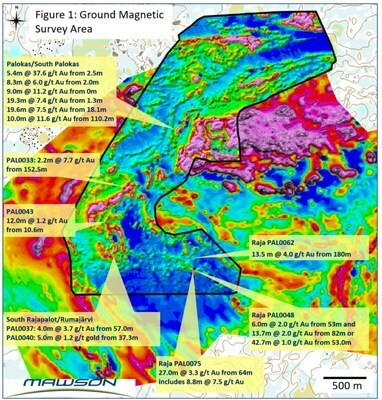 VANCOUVER, Feb. 26, 2018 /CNW/ - Mawson Resources Limited ("Mawson") or (the "Company") (TSX:MAW) (Frankfurt:MXR) (PINKSHEETS: MWSNF) announces completion of an infill ground magnetic survey at the Company's 100% owned Rajapalot gold project in Northern Finland. Three diamond drill rigs continue to operate on site 24/7 with initial results anticipated within the next week. Drilling continues with three diamond drill rigs operating around the clock. Initial drill results will be released during the first week of March. Mr. Hudson, Chairman and CEO, states, "With more than 60 people working at site and initial drill results imminent, we are excited to see that detailed ground magnetic data demonstrates both continuity of the host horizons and structural control on gold mineralization. As the gold at Rajapalot is commonly associated with both pyrrhotite and magnetite, ground magnetics is a valuable tool to directly map gold-bearing host rocks under the thin glacial soil that covers 99% of the area. We look forward to testing more targets with the many diamond drill rigs currently on site." The completed infill ground magnetic survey covers the current winter drill program area and was designed to accurately locate the pyrrhotite-bearing rocks that are intimately associated with gold mineralization. Detailed ground magnetics over the Palokas Prospect reported in News Release of April 24, 2017 indicated the benefit of closer line spacing over mineralized areas. Figure 1 shows the location of the new survey with preliminary processed magnetics overlying the 50 m spaced ground magnetic survey from 2017. Prospects with summarized results from the News Release of July 05, 2017 are also included in Figure 1. Mineralization consists of sulphide (pyrrhotite>>pyrite), magnetite, biotite, muscovite and chlorite hydrothermal mineral assemblages hosted in predominately grey albitites. Textures range from veined albitic granofels through fractured and brecciated to locally schistose. Veining and fracture fill minerals include pyrrhotite, magnetite and magnetite-pyrrhotite (+/- quartz). Local retrograde chlorite after biotite and vein-controlled chlorite+/- tourmaline and magnetite are also present. Preliminary hand-held XRF analysis confirms the presence of associated scheelite and molybdenite, the former visible under UV light as tiny veinlets and disseminations. The iron-rich nature of the mineralized rocks is a common theme in either the oxide or sulphide form, with a variably sulphidic and chloritic overprint. The alteration is clearly post-metamorphic, reduced, and most likely driven by granitoid intrusions. Chlorite is regarded as the lowest temperature silicate mineral with gold, structurally controlled in apparent association with quartz veins. Altered rocks enclosing the mineralized package contain locally abundant talc and tourmaline. There is a strong structural control on mineralization that is superimposed on reactive stratabound units with elevated transition metals characteristic of now-metamorphosed and deformed, but depositional redox boundaries. Detailed ground magnetics can map the extent and deformation of these key horizons. In other news, 66 people including geologists, field technicians, environmental staff and drilling contractors are now working in Finland with three diamond drill rigs operating 24 hours per day with a further two drill rigs planned to join the program in mid-March. Sixteen diamond holes from 12 drill pads have been completed in 2018 and are currently being logged for geotechnical, geological and geophysical parameters. The drill rigs are currently located at the Raja prospect (2017 drill results included PAL0075: 8.8 metres @ 7.5 g/t gold from 82.2 metres), South Palokas prospect (prior drill results included PAL0016: 8.4 metres @ 4.2 g/t gold from 206.0 metres in PAL0016, including 3.4 metres @ 9.5 g/t gold from 211 metres) and the Palokas prospect (2017 drill results included PAL0030: 10.0 metres @ 11.6 g/t gold from 110.2 metres). The first batches of samples have now been submitted for assay, and Mawson looks forward to commencing reporting assays in the first week of March. The ground magnetic survey was conducted by two personnel from GeoVista AB (based in Luleå, Sweden). The area discussed here is now covered at 25 metre line spacing with the remainder of the Rajapalot ground survey at 50 m line spacing. Line orientations for this program were matched with prior survey parameters. Levelling and post-collection processing are completed by Dr Hans Thunehed of GeoVista AB.